Jesus came as King. He did not come as a king in robes of royalty or with a fine palace and a royal court. Instead, Jesus came as the King of Truth in simplicity and with a band of everyday folks called apostles. His mission was not to conquer the political landscape, but for God's truth to win the hearts of the people — all people, not just the Jewish people. Truth, however, is dangerous for some people. Every pretender to royalty is threatened by one who is genuinely qualified. The pretenders fear the truth. So the true King was murdered so that all the pretenders could feel secure. The only problem was that once the truth was out there, no political power and no royal pretender could keep the truth from triumphing. Where is Pilate's power today? And Herod's thirst for royal recognition? And Caesar's rule? And the Roman Empire? All are gone, with nothing left but old stones and the history books to tell about their passage across the stage of time. 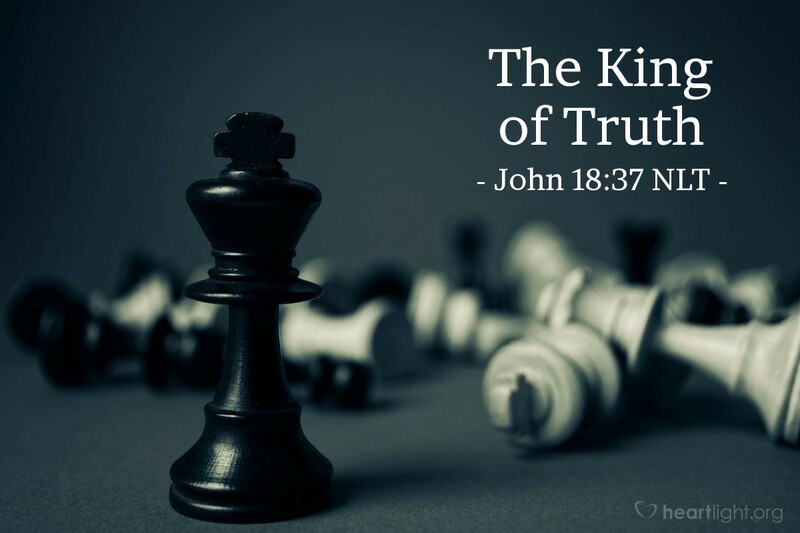 On the other hand, one King still reigns over the hearts of men and women from all races — Jesus, the King of Truth! Father, thank you for the blessing of an everlasting Kingdom and a triumphant King — your Son and my Savior, Jesus. May his truth and his Kingdom come to complete triumph in my life. Amen.